Massively parallel sequencing will be applied to hundreds or thousands of tumor genomes this year. Catalogues of somatic alterations in human cancers (e.g. COSMIC) will grow, perhaps as exponentially as dbSNP did in the past decade. Perhaps more importantly, we will begin to see cases where whole-genome or whole-exome sequencing of a patient’s tumor guides his or her treatment. Bridging the gaps between mutation discovery, biological interpretation, and clinical action, however, will be a substantial challenge. Hence the theme of this month’s posts, cancer biology and pathology. Just over a decade ago, Douglas Hanahan and Robert A. Weinberg published the landmark article “The Hallmarks of Cancer” in the journal Cell. At the time, nearly a quarter-century of rapid advances had revealed a wealth of knowledge about this deadly disease. Although more than 100 subtypes of cancer had been described, Hanahan and Weinberg described six principal cellular traits shared by virtually all forms of human cancers. Collectively, these essential alterations in cell physiology dictate tumor development and growth. 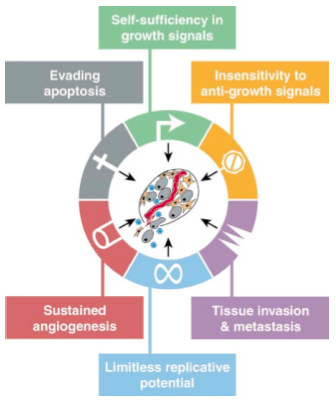 Each of these six acquired capabilities – evasion of apoptosis, self-sufficiency in growth signals, insensitivity to growth inhibition signals, limitless replicative potential, sustained angiogenesis, and tissue invasion/metastasis – represents the successful circumvention of inherent anticancer defense mechanisms of cells and tissues. Most of these acquired capabilities arise from somatic alterations – mutations, structural events, and epigenetic changes – which presents something of a dilemma. Thanks to a swath of fastidious DNA monitoring and repair enzymes, mutation is a rare event, and altering the critical genes to successfully acquire each capability is inefficient. For a single cell to achieve all of them in the span of a human lifetime is, well, statistically improbable. The authors suggest a seventh principle, not a hallmark of cancer but a universally enabling characteristic, to explain the means by which these six biological endpoints are reached: genomic instability. Mutations that cause genomic instability are likely critical, early events in tumorigenesis. Studies have shown that mutations in DNA repair genes (e.g. ATM, RAD51, CHEK1) and, more recently, components of DNA methylation pathways (DNMT3A/DNMT3B) are recurrently mutated in human cancers, suggesting an important functional role in disease development. Modulation of extracellular growth signals, for example, the production of PDGF and TGF-alpha by glioblastomas and sarcomas, respectively. Alteration of the trans-cellular signal transducers (surface receptors), e.g. the up-regulation of EGFR in stomach/brain/breast tumors and HER-2 in mammary tumors. Deregulation of the intracellular signaling pathways linked to transmembrane receptors, such as the Ras/Raf/mitogen activated protein kinase (MAPK) cascade. The authors suspected that growth signaling pathways suffer deregulation in all human tumors. Ten years later, we know that this is largely true. Large-scale sequencing efforts have revealed that mutations in Ras-family genes (KRAS, NRAS, HRAS, etc.) and MAP kinase genes are frequent events in human cancers. In breast cancer, for example, PI3 kinase genes are among the most highly mutated, suffering alterations in as many as 40% of tumors. In normal tissue, both soluble factors and matrix-embedded inhibitors cooperate to maintain homeostasis by blocking cell growth. Much like growth stimulation, these signals are transduced to cells via transmembrane receptors and then into complex intracellular circuits. At the molecular level, most or all anti-proliferative signals are funneled through retinoblastoma (Rb) related proteins. When hypophosphorylated, Rb sequesters and alters the functions of E2F transcription factors, which normally serve to activate a number of genes required for transition from G0 to S-phase. The best documented modulator of Rb signaling is TGFB, a soluble signaling molecule that suppresses cell growth. TGFB prevents the phosphorylation that activates Rb, thereby blocking the advance through G1. Tumor cells disrupt TGFB signaling by a number of mechanisms, including downregulation or alteration of its cellular receptor, or mutation of the key transducer of TGFB signaling, Smad4. One way or another, the anti-growth circuit converging on Rb is disrupted in a vast majority of human malignancies, virtually “defining the concept” of tumor suppressor loss in cancer. I won’t dwell much on this topic, since much of it was covered in my post on Cancer Versus the Immune System. Simply put, evasion of apoptosis is a hallmark of many and perhaps all human cancers. Most types of mammalian cells carry intrinsic programs that limit their replication. Once cells reach a certain number of divisions, they stop growing, or senesce. In culture, human fibroblasts can be forced to keep dividing (by knocking out p53 and pRb tumor suppressors) beyond this point. These cells eventually enter a crisis state characterized by karyotypic disarray and massive cell death. A small fraction of cells, however, continue to grow and divide without limit, a trait known as immortalization. The limit for most normal cell types is 60-70 divisions, after which they enter senescence. Obviously tumor cells surpass this limit, managing to grow and progress even while undergoing massive apoptosis. One key rate-limiting mechanism in cell division is the length of chromosome telomeres, which decreases by 50 to 100 base pairs with each consecutive cell division. At some point, telomere loss introduces massive genetic instability, and crisis ensues. Many, if not all tumor cells address this issue by up-regulating telomerase, the enzyme that extends telomeres. This maintenance operation is a key component for enabling limitless replication potential in tumor cells. Here’s something I didn’t know: virtually all cells must remain within 100 um of a capillary blood vessel to get the oxygen and nutrients they need to survive. You’d think that because of this limitation, rapidly proliferating cells must have an intrinsic ability to induce angiogenesis (blood vessel growth). It turns out, not so much. The ability to stimulate angiogenesis is not inherent in normal cells or developing neoplasias, and represents an acquired capability that successful tumors must achieve. Like the other biological processes discussed in this review, angiogenesis is encouraged or prevented by a complex network of signaling molecules. Soluble factors, cell surface receptors, integrins, and cell adhesion molecules all play a role in the counter-balancing of blood vessel growth. Vascular endothelial growth factor (VEGF) and fibroblast growth factors (FGF1/FGF2), for example, are molecules that stimulate angiogenesis initiation. Thrombospondin-1 is an important inhibitor of this process. Tumor cells encourage blood vessel invasion/growth by up-regulating inducers and suppressing inhibitors, often at the level of transcription. Loss of TP53, for example, causes thrombospondin-1 levels to fall, thereby reducing the latter’s inhibitory potential. Similarly, Ras activation and loss of the VHL tumor suppressor induce an up-regulation of the gene encoding VEGF. More recently, we’ve come to realize that the transmembrane receptors for angiogenesis-stimulating molecules (VEGFR, FGFR) are commonly mutated in human cancers. Eventually, tumor cells venture out from the primary lesion to colonize and grow in other, often distant parts of the body. Ultimately, it is these metastases that account for 90% of cancer deaths. Several families of proteins involved in tethering cells to their surrounding tissue are altered during this process. Perhaps the best-known of these are cell-cell adhesion molecules (CAMs) and integrins, which mediate cell-cell interactions and cell-matrix interactions, respectively. One example of the communication between cell and environment is offered by E-cadherin, which is expressed on the surface of epithelial cells. Bridging of E-cadherin receptors between adjacent cells triggers anti-growth signals within the cell (Lef/Tcf transcription factor activation) via cytoplasmic B-catenin. A number of epithelial cancers block this pathway, either by mutational inactivation of E-cadherin or B-catenin genes, transcriptional repression, or proteolysis of the extracellular E-cadherin domain. Integrins have dozens of subtypes with distinct substrate preferences. Successful colonization by tumor cells at a distant site requires adaptation, which is often achieved through shifts in the spectrum of integrin alpha- and beta-subunits displayed by migrating cells. Support for this idea can be seen even in cell culture, where forcing expression of different integrin subunits can induce invasive and metastatic behavior. This aspect of tumor progression will be especially challenging to characterize, because there are large numbers of integrin genes and many, many unique heterodimeric receptors that can be generated by differential subunit expression. It was clear even a decade ago that the innate defense mechanisms of cells to prevent transformation and metastasis are diverse and complex, and the processes by which tumor cells subvert those defenses are equally so. Nevertheless, Hanahan and Weinberg postulated that 10-20 years after the time of writing this review, diagnosis of virtually all somatic lesions within a tumor would be a routine procedure, as would comprehensive gene expression analysis. With such knowledge in hand, it would be possible to definitively test whether all tumor types behave according to a set of common rules like the ones outlined above. We aren’t quite able to provide those answers just yet, but given the rapid advances of next-gen sequencing, that day is soon coming. The human immune system is an incredible success story of evolution. It defends against a constant barrage of external threats – bacteria, viruses, and other pathogens – and, as I’ve recently learned, protects against an intrinsic threat: cancerous cells. In their review “Natural and Adaptive Immunity to Cancer“, Vesely and colleagues draw from recent mouse models of cancer and human clinical data to describe how cells, effector molecules, and pathways of the immune system act to suppress and control tumor cells. It’s not all good news, however. Apparently, certain immune system pathways (e.g. inflammation) instead serve to promote tumor growth. Cells already have an array of intrinsic defense mechanisms that halt the transformation process. Numerous cellular proteins detect DNA damage and induce senescence, a permanent change of state characterized by morphological and gene expression changes. The activation of oncogenes, too, can trigger senescence. In fact, the hijacking of Ras signaling to escape senescence and proliferate is a key requirement for cell transformation. Alternatively, cells that sense injury or loss of mitochondrial integrity may undergo programmed cell death (apoptosis). This process may also be initiated externally by the ligation of tumor necrosis factor (TNF) family ligands to their corresponding receptors: TNF, TNF-related apoptosis-inducing ligand (TRAIL), and Fas ligand (FasL). There are still other, non-apoptotic paths to cell death (necrosis, autophagy, mitotic catastrophe) that are gaining attention as barriers to transformation. Immunosurveillance, in which transformed cells are identified and destroyed before they can establish malignancy. The idea that the immune system might recognize and destroy tumor cells was conceived 50-100 years ago. This concept of “immunosurveillance” remained controversial, and saw little progress until the 1990’s. Does this story sound familiar? It’s much like the story of cancer and the metabolism, which also saw a long period of general ignorance before its “rediscovery” in the 1990’s. Mice get the credit for rekindling interest in the immune system’s tumor suppressor potential. Specifically, mice that were immunocompromised after loss of interferon (IFN) signaling or T-cell function. Such animals were significantly more susceptible to sarcomas after exposure to methylcholanthrene (MCA), implicating a role for the immune system in preventing these tumors in healthy mice. Over the last 10 years, work from many labs (including the authors’) has demonstrated how the immune system works to prevent outgrowth of many types of primary and transplanted tumors. The RAG2-knockout mouse, which is deficient in T-cells, B-cells, and natural killer (NK) cells, develops more spontaneous cancer lesions and is also more susceptible to MCA-induced sarcoma. Interestingly, a significant portion (40%) of tumors that develop in RAG2-knockout mice are rejected when transplanted to immunocompetent (wild-type) mice, demonstrating that normal immune system function successfully suppresses these cells. Sarcomas induced in wild-type mice (with MCA), however, grow unrestricted when transplanted to other mice. These observations suggest a dual role for the immune system: in wild-type mice, it protects against tumor development, but also edits the immunogenicity of developing tumors, allowing them to grow unimpeded when transplanted to healthy mice. Elimination, when innate and adaptive immune cells work together to identify and destroy tumor cells before a malignancy can form. Equilibrium, a phase when the immune system contains tumor outgrowth but does not eliminate transformed cells entirely. Escape, in which tumor cells grow unrestricted by the immune system, and develop into clinically apparent disease. Both elimination and equilibrium might be considered satisfactory clinical endpoints for a patient, because tumor cells are either destroyed entirely or held in check to prevent outgrowth of disease. The transition from equilibrium to escape is facilitated, at least in part, by the micro-evolution of the tumor cells during equilibrium. The selective pressure of immune recognition and destruction selects for tumor cells that are less immunogenic. Also aiding tumor escape is the breakdown of the immune system, either naturally (as a person ages) or as a direct result of immunosuppression (often induced by the tumor). Humans and mice have similar immune systems, with a largely overlapping repertoire of immune cells and effector molecules. The development of mouse strains deficient for specific genes, and the induction of tumors by carcinogens MCA (sarcoma) and DMBA/TPA (papilloma) have demonstrated that NK cells and cytotoxic lymphocytes (CTLs) suppress tumor initiation and growth in vivo. Interferon signaling also plays a key role in immunosurveillance, as demonstrated by the increased tumor susceptibility in mice lacking perforin, IFN-γ, IFNGR1, TRAIL, IL-12, TNF-α, and DNAM-1. Numerous cytokine molecules and receptors have also been implicated in controlling induced tumors. Mice deficient in IL-12, for example, develop increased numbers of papillomas than wild-type mice. Interestingly, mice lacking IL-23 or IL-17A are resistant to tumor development, suggesting a tumor-promoting role for these cytokines. Interestingly, DMBA/TPA exposure in mice lacking the TRAIL receptor did not affect the number of induced tumors, but did increase the rate of metastasis to lymph nodes (compared to wild-type mice), indicating a role for TRAIL-R in suppressing metastasis. The incidence of spontaneous tumors in normal mice is very low, possibly because they have long telomeres. Many strains of immunodeficient strains fail to develop tumors even after two years of observation. Aging studies in knockout mice, however, have elucidated the roles of certain genes, effector molecules, and immune cells in the defense against spontaneous tumors. This is an elegant type of experiment that requires some patience; one simply removes specific components of the murine immune system and monitors them for spontaneous tumor development. One striking discovery highlighted in this review was the incidence of immunogenic B-cell lymphomas, which increases from 0-6% in wild-type mice to 40-60% in mice lacking perforin, a cytolytic protein used by NK cells and T-lymphocytes. Penetrance of lymphomas in these mice is even higher when they also lack MHC class I accessory molecules (B2M) or IFN-γ. These observations support the importance of “cytotoxic” immune cells in protecting against spontaneous tumors. Aging experiments have also been performed in mice lacking specific immune cell types. RAG-2 knockout mice, for example, develop significantly more ephithelial tumors (35% gastrointestinal, 15% lung), even when raised on broad-spectrum antibiotics in a pathogen-free facility. RAG-2 knockouts that also lack STAT1, a key player in interferon I/II signaling, develop an earlier and broader spectrum of malignancy, including colon and mammary adenocarcinomas. The equilibrium phase, in which the immune system holds tumors in check but fails to eliminate them entirely, is an interesting phenomenon. Here we observe a dynamic balance between a powerful immune system response and a genetically heterogeneous population of tumor cells that can persist for a number of years. It has become clear that adaptive immunity, and not innate immunity, takes the lead in controlling tumor outgrowth. This has been demonstrated by experiments in which healthy mice are subjected to low levels of carcinogen exposure (which tends to induce few tumors) and later depleted for CD4+/CD8+ T-cells and/or IFN signaling. As many as 50% of apparently tumor-free mice develop sarcomas at the injection site upon this depletion, suggesting that micro-tumors were present but held in check by adaptive immunity. Granted, the tumors that arise after immunodepletion tend to be highly immunogenic; when transplanted to healthy mice, 40% are rejected by the competent immune response. In contrast, sarcomas obtained from mice that were not immunodepleted tend to grow progressively when transplanted. Although we have fewer experimental liberties with human subjects, clinical and epidemiological data have proven useful. Human patients with specific perforin mutations, for example, not only develop familial hemophagocytic lymphohistocytosis as adults, but have recently been shown to also develop leukemia and lymphoma. Surveillance of human patients with AIDS has shown an increased frequency of several malignancies due to the immunodeficiency. Most often, these tumors are induced by pathogens, such as Epstein-Barr virus (lymphoma), herpesviruses (Kaposi’s sarcoma), and human papilloma virus (cervical cancer) that fail to be eliminated by the deficient immune system. Intentional immunosuppression in the recipients of organ transplants can also increase the risk of cancer. Patients receiving kidney transplants, for example, exhibit a three-fold increase in overall malignancy. Most of these, too, are virus-associated tumors, though there’s also an increased risk for colon, lung, pancreas, and other non-infectious cancers. Renal transplant patients are a dramatic example; these individuals have a 200-fold (yes, two hundred) risk for non-melanoma skin cancers, highlighting the importance of immunosurveillance in tumors induced by exposure to UV radiation. Further, the duration of pharmacology-induced imunosuppression and incidence of cancer are positively correlated; that is, the longer the immune system is suppressed, the more likely a tumor will form. Taken together, these observations support the importance of immunosurveillance in preventing human cancers. Further evidence of the immunity-cancer relationship, particularly the equilibrium phase, is offered by the occasional organ recipients who develop cancer that originated from the organ donor. I’m horrified to hear that this can happen, but it does. Often, the donors had died of other causes and bore no signs of clinically-detectable disease, suggesting that their immune systems had held cancerous cells in check. The combination of a naive immune system, and immunosuppressive therapies required for successful engraftment, allows these tumors to grow without restriction in the unfortunate recipient. Perhaps the most compelling evidence for the anti-cancer role of the immune system is the spontaneous regression of melanoma tumors accompanied by T-cell clonal expansion. This phenomenon suggests the ability of CD4+ and CD8+ T-cells to identify tumor-specific antigens and destroy cancerous cells. As many as 100 tumor-associated antigens (TAAs) generate an antibody response in patient serum, though only 8 have been observed in multiple studies. This suggests that TAAs, much like somatic mutations, are largely unique to individual tumors. T-cell responses vary from antigen to antigen; for example, responses to MAGE family antigens are rare, whereas responses to melanocyte differentiation antigen (MART/Melan-A) are seen in >50% of healthy individuals. More studies are needed here to catalogue TAAs and quantify their antigenicity across patient populations. Here, too, is where high-throughput sequencing of tumor genomes might offer useful information as well. Knowledge of the full set of protein-coding mutations in a tumor might shed light on its immunogenic potential, or vice-versa, thereby leading to better informed prognoses and treatment decisions. Even without complete tumor regression, the presence and quality of tumor-infiltrating lymphocytes (TILs) – NK cells, T-cells, and NKT cells – has a favorable prognosis for numerous tumor types. This correlation was first observed in melanoma, where patients with high CTL infiltration of their tumors survived longer. A “landmark” study in ovarian cancer found that 38% patients with high TIL numbers survived longer than 5 years, compared to 4.5% of patients with low TIL numbers. Studies in colon and lung cancers have found that the type and density of TILs was more powerful prognostic indicator than the clinical stage of the tumor. There is, of course, a downside to TILs: when they’re macrophages or regulatory T cells. High numbers of these can have a poorer prognosis, possibly due to their immuno-suppressive functions. Chronic inflammation can contribute to cancer by inducing genotoxic stress, cell proliferation, angiogenesis, and even enhancing tissue invasion. Even so, the tumor-promotion activities of inflammation and tumor-suppressing actions of the immune system are not mutually exclusive. In the authors’ mouse model of MCA sarcoma, for example, tumor development requires several inflammation molecules (MyD88, IL-10, IL1B,and IL-23), but these factors induce the host-protective immune response (IFN and T-cells) that destroy the tumors. In other primary carcinogen models, MyD88 and IL1B promote tumor development, but also facilitate the recognition of dying tumor cells that leads to anti-tumor immunity. Another important role of inflammation is the transition from equilibrium to escape, when inflammatory and regulatory immune cells are recruited to the tumor, and then subverted to dampen anti-tumor immunity, allowing cancer progression. Indeed, the authors suggest that pro-inflammatory transcription factors NF-KB and STAT3 may be valuable therapeutic targets, whose inhibition may facilitate the transition from tumor-promoting inflammation to tumor-suppressing immunity. A number of complex biological forces drive the mutation and selection of cancer cells – competitive growth, angiogenesis, immune system evasion, etc. A recent review in the journal Science has shed light on another key aspect of tumor development – the hijacking of the metabolism. Over 80 years ago, Otto Warburg observed that tumor cells exhibit a different metabolic pattern than normal (adult) cells: increased glucose uptake and aerobic glycolysis coupled with decreased oxidative phosphorylation. The pyruvate generated by glycolysis is converted to lactate and secreted from the cell. He suggested that this metabolic switch explained the cancer phenotype and possibly represented a causal event in tumorigenesis. Synthesis of the substrates for membranes, nucleic acids (purines and pyrimidines), and proteins. In normal differentiated cells, the need for cell division is low. Glucose metabolism is therefore optimized for efficient energy generation: glycolysis in the cell linked to the tricarboxylic acid (TCA) cycle (also known as the “Krebs cycle”) in mitochondria. In times when rapid cell division is required, however – during development, wound healing, or for immune responses – cells need to synthesize substrates for membranes, nucleic acids, and proteins; in other words, the intermediates for cell growth. This means not metabolizing all glucose to carbon dioxide and water. One way that cells accomplish this by slowing the entry of pyruvate into the mitochondria. The last step of glycolysis is catalyzed by pyruvate kinase, which receives input about the energy status of the cell and the presence of these intermediates. This enzyme is normally stimulated in a feed-forward loop by glycolysis. However, cancer cells make a splice variant, the M2 (fetal) isoform of pyruvate kinase in which several amino acids are added, including a tyrosine. This gets phosphorylated in tumors with activated tyrosine kinase signaling, inhibiting the feed-forward loop. Thus the last step of glycolysis is slowed in cancer cells, and keeps those intermediates around for growth. A side-effect of delaying the TCGA cycle is the accumulation of pyruvate in the cell. As it builds up, pyruvate is converted to lactate and secreted, in order to keep glycolysis active. The secreted lactate lowers the pH of the cellular matrix; in tumors, this may influence remodeling of the matrix and help stimulate blood vessel invasion (angiogenesis). The use of glycolysis by tumors can make them acidotic, encouraging the selection of motile cells that can break free of the basement membrane and metastasize. Proliferating cells, including cancerous ones, also require favorable energetics – that is, higher ATP/ADP and ATP/AMP ratios. Many tumors satisfy this need by increasing glucose uptake. Glucose is brought into the cell by several transmembrane glucose transporters (GLUT1 to GLUT9), and then phosphorylated by one of several hexokinase enzymes to keep it in the cell. MYC and HIF-1, transcription factors and oncogenes that are often amplified in tumors, stimulate transcription of GLUT transporters and hexokinase 2, thereby ensuring that more glucose is brought into and kept in the cell. Many but not all tumors exhibit increasd glucose uptake in this fashion, which can be observed by PET scans of radioactive F-19-2-deoxyglucose. Cancer cells also take up excessive amounts of glutamine (via glutamine transporters), which is converted to glutamate by glutaminase-1 before entering the mitochondria. There, the TCA cycle produces malate and citrate, both of which leave the mitochondria. In the cytosol, malate is converted to pyruvate and NADPH, while citrate is processed to or alpha-ketoglutarate (producing NADPH), acetyl-CoA (for lipid synthesis), or oxaloacetate (for amino acid synthesis). The increased uptake of glucose and glutamine by cancer cells thus helps fuel cell growth and proliferation, but it comes at a cost: excessive reactive oxygen species (ROS), which damage membranes, proteins, and nucleic acids. The major eliminator of ROS in a cell is glutathionine (GSH). This molecule accepts an electron, and is converted to the oxidized form glutathionine sulfate (GSSG). The enzyme glutathionine reductase uses another molecule, NADPH, to reduce GSSG back to its “eliminator” form (GSH). NADPH can be generated either from the citrate output of the TCA cycle, or via the pentose phosphate pathway (PPP) if there’s plenty of glucose available. Thus, when a cell starts to run too hot from oxidative reactions (e.g. glycolysis), NADPH serves as a sort of cellular coolant. Of course, high levels of ROS can be advantageous for cancer cells. Damage to nucleic acids can promote mutagenesis or genomic instability, helping stimulate cell proliferation and immune system evasion. Even so, ROS levels that are too high will induce oxidative damage-induced cell death in cancer cells. Levine and Puzio-Kuter suggest that ROS thus have therapeutic potential, as they might be exploited to selectively kill cancer cells. In the last decade, research has revealed a number of key oncogenes (myc, NFKB, AKT, EGFR, IGF1, etc.) that activate the Ras, MAPK, mTOR, and phosphatidylinositoal 3-kinase (PI3K) pathways. These pathways stimulate the transcription of a number of important players in the glycolysis and glutaminolysis pathways. Myc alone activates the transcription of over 1,000 genes related to cell growth and metabolism. For example, it enhances transcription of glutaminase-1, which produces glutamate from glutamine. Myc also represses miR-23a and miR-23b, which increases expression of their intended target, mitochondrial glutaminase-1. Reduces glucose uptake, by repressing transcription of the GLUT1 and GLUT4 transporters. Decreases glycolysis, by activating the TIGAR gene which leads to diversion of glucose through the PPP. Controls ROS levels through regulation of genes such as Sestrins 1, 2, 3, and 4. TP53 also stimulates transcription of PTEN, IGF1BP3, TSC2, and the beta sub-unit of AMPK, all of which are negative regulators of the PI3K-AKT and mTOR pathways. The loss of tumor suppressors TP53 and PTEN, along with concurrent activation of AKT and mTOR pathways, results in high hypoxia-induced factor (HIF) activity. As you might guess from its name, HIF is regulated by the cell’s response to hypoxia. The absence of oxygen allows HIF-1A and HIF-2A proteins to form dimers with their beta-counterparts (HIF-1B and HIF-2B), stabilizing the HIF transcription factor complex. HIF increases the transcription of hundreds of genes, promoting angiogenesis, cell migration, and survival. It also regulates genes involved in energy metabolism, including lactate dehydrogenase A and pyruvate dehydrogenase kinase, both of which keep pyruvate away from the mitochondria, and 9 of the 10 enzymes required for glycolysis. Mutations in the genes that encode TCA cycle components (enzymes) have been linked to human cancers. Rare mutations in succinate dehydrogenase (SDH) and fumarate hydratase (FHY) are initiating events in familial paraganalioma and papillary renal cell cancer. In glioblastoma multiforme (GBM), mutations in the gene encoding isocitrate dehydrogenase 1 (IDH1) block the conversion of isocitrate to alpha-ketoglutarate and generation of NADPH. IDH1/IDH2 mutations are recurrent in gliomas and leukemias, and recently have been shown to produce a new enzymatic activity: the reduction of alpha-ketoglutarate to 2-hydrozyglutarate, an “oncometabolite”. Clearly, the metabolic switch observed by Warburg is important for the development, growth, and survival of many cancers. While some of the mechanisms by which tumors induce the “Warburg effect” have been elucidated, it’s likely that many of them remain to be discovered. Consideration of a gene’s involvement in cell metabolism or its regulation therefore will be critical as we sift through the mutations of newly sequenced cancer genomes.